Ronald Keith Milstein, 54; Alejandro Castano, 35; John Doe, 59; Jane Doe, 52 (both names not released). Know them? Probably not and neither do I. These four 9/11 World Trade Center victims’ remains were finally identified just this past April — almost seven years after the attack. I just wanted you to know that even now, more than 40% of the victim’s have yet to have their remains identified, leaving those families with only the WTC site — now a gaping construction pit — as the only place for them to gather to remember those lost on that day. As I travel around the country, especially away from the big population centers of NY, Boston, D.C. and even L.A., it strikes me that those of us who live in the areas that were attacked are still hurting whereas most of the country has moved on. And so, as we remember those who died on that day and (for some of us) as we continue to hear the screaming voices buried deep within our souls, let’s renew our resolve as a country to prevent this from happening again. I originally planned to post this yesterday, on the 7th anniversary, but came to realize that this date still affects me more than I’d care to admit. P.S. 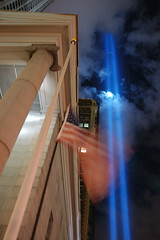 – As we dicsuss the billion$ in overruns in the planning and construction of a 9/11 memorial here in New York City, aren’t the two beams of light reaching towards heaven the ultimate memorial? Felt the same way, Ron. Didn’t blog anything about 9/11 until a few minutes ago myself. I thought about 9/11 throughout the day but didn’t have any “deep” conversations as I had in years gone by. Is it because I’m not with East Coasters? There were memorial services held here just as there were in other parts of the country. I think our grief and memories are evolving, and I think the ongoing “war” mixes with memories of that day and raises the uncertainty for people about what they’re feeling and how to reflect. Even now, I’m silent. I posted my memories in the comments of another’s blog. I just couldn’t find the right words.